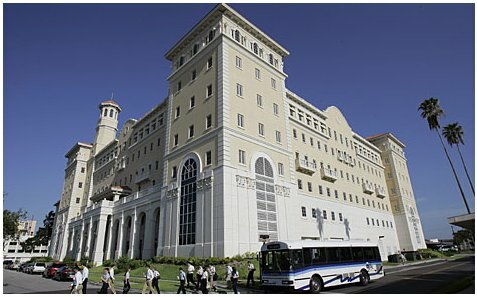 The seven-story Flag Building, also known as the "Super Power Building," will be the largest Scientology structure in the world when completed late 2008, and is expected to draw thousands more visiting believers to Clearwater, Fla. It appears that Clearwater is to Scientologists what Salt Lake City is to Mormons, what Mecca is to Muslims. You may be curious about Scientology because some of its members are famous celebrities; including John Travolta, Tom Cruise, Kirstie Alley, Mimi Rogers, and Anne Archer, Jenna Elfman, Isaac Hayes, and others. Before you really get interested --begin looking at Scientology as a cult with many wacky ideas. Scientology is itself a money-making Church that will ultimately lead you into believing satan's garden of Eden lie that you are a God yourself. This same lie is found in both New Age and Masonic dogmas. Also a root Scientology dogma about religion sounds much like it could have been written by Karl Marx. According to Scientology's secret cosmology, it must first free man from the aberration of religion to undo the political control implant. Islam, Scientology, and Mormonism have similar beginnings. All are based on the rantings and ravings of a single individual. There is quite a bit of evidence that L. Ron Hubbard was a megalomaniac, driven by greed, who was incapable of telling the truth. Scientology is comprised exclusively of the teachings of one man: Lafayette Ron Hubbard (aka: L. Ron Hubbard). Hubbard's theories, assumptions, and techniques for practical applications that make up the rituals of Scientology, are sometimes called the “Spiritual Technology,” or simply “the Tech.” L. Ron Hubbard lived between 1911 and 1986. He was a very successful author, having published hundreds of novels, novelettes and short stories; most dealt with science fiction. Scientology was built by this one man (Hubbard). L. Ron Hubbard had a great gift of boasting about his life. L. Ron Junior wrote this about his father's boasts: "I would say that 99 per cent of what my father has written about his own life is false." --- L. Ron Hubbard Jr. L. Ron Hubbard was a devout racist who wrote in praise of South African Apartheid. He was a crazed misogynist (woman hater) who insisted women were inferior intellectually. It is very wrong for Scientologists to deceive Christians into thinking that scientology is in some way compatible with Christianity! Scientology is not connected to Christianity! In fact, Scientology teaches that Jesus Christ did not exist (RE: Hubbard's CL VIII tape). Hubbard ridiculed other religions, but the Church of Scientology had no qualms about adopting Christian trappings and traditions to establish its bona fides as a “real church.” The Scientology symbol is a modified Christian cross which has an obvious resemblance to the masonic Golden Dawn's Rose Cross. To a Scientologist the man on the Christian Cross is not Christ! There was no Christ to L. Ron Hubbard. But the man on the Scientology cross is shown as "Everyman" to them. For many years, Scientology staff wore clerical collars; in the spring of 2000 the Church of Scientology also began promoting regular Sunday services. It is a well documented fact that the religion of Hubbard was Satanism. Hubbard's mentor was, in fact, the infamous English black magician Aleister Crowley. Hubbard reportedly discovered Crowley's works as a teenager on a trip to the Library of Congress with his mother. Hubbard took up ritual magic, the occult and hypnosis, giving demonstrations of hypnosis in 1948 and writing to his literary agent about a therapy system he was working on that had tremendous promotional and sales potential. Piecing together hypnotic techniques, Freudian theories, Buddhist concepts and elements of other philosophies and practices, Hubbard came up with Dianetics. He published the very dull and hard to read book; "Dianetics: The Modern Science of Mental Health" in 1950. In this book, Hubbard claims that his "modern science of mental health" will cure everything from schizophrenia to arthritis; claims for which he presents no credible evidence. Hubbard suggests in his "History of Man" that many of our problems may be traced to former lives. Smoking tobacco results from smokers dramatizing volcanoes they saw in previous lives he says. Psoriasis is an engram received from when an animal ate you; the psoriasis resembles the digestive fluids of the animal that ate you. Vegetarians got tired of being eaten by animals in former lives. Fear of falling can be traced to being a sloth and falling out of trees. Hubbard's "History of Man" also teaches us that the Piltdown Man was part of the evolutionary chain for man. Hubbard called it man's first real manhood. Hubbard had already published his statements about the Piltdown man prior to the Piltdown skull having been declared a hoax in 1953. Rather than retract the statements for this new religion of Scientology, since the History of Man forms a part of its scripture, Hubbard simply ignored it and never spoke of the evolution of the Piltdown Man again. Note: Christian Scripture is adamant that there is no reincarnation... We die once. Scientology appeals to people by offering them a grand game; a unique and comprehensive self-improvement system; a solution for almost every problem (many people come to Scientology when their lives are in crisis); and a welcoming group focused on major societal issues such as drug abuse, mental health, education, spirituality and morality. The fact of the matter is this. Like the Jehovah Witness "cult", Scientology is a pyramid scheme. Those at the top make a lot of money and would defend at all costs what they are doing. And, both make huge amounts of money via selling printed materials, and recordings. It gets even more lucrative when deceived gullible adherents give them huge grants. WHAT YOU have to remember is that while these people may be good people, they will lie to you about everything," says one former Scientologist, who was involved in the organization for four years in the early 1980s. "It is okay to lie in Scientology, in fact these people really believe what they are saying is true. That is the nature of a cult." "Scientology is based on lies, you can never trust what they are saying," he reiterates. After joining the Church of Scientology, one meets with increasing demands for money, time and recruiting others. Those who resist these demands bolt, usually quickly. Those who remain go step-by-step into agreement with indoctrination, all the while believing that they are becoming more aware and self determined. Scientology proposes that in its “native state” the spirit/thetan is immortal and god-like and possesses the potentiality of knowing everything, but that in present time its true capabilities have been lost and forgotten. As an immortal entity, the spirit/thetan lives on after body death and is born into a new physical body, again and again, lifetime after lifetime, in an endless cycle of birth and death. As a result of traumatic incidents extending back from the present life through a long series of “past lifetimes” hidden from conscious memory, the spirit/thetan has become trapped in the physical body and the physical/MEST universe. Islam, Scientology, Mormonisn and Jehovah Witnesses all reject the Gospel of Jesus -- and therefore these push their members away from the true road to salvation. Jews also reject this. But as Paul says--Jews have been supernaturally blinded. Mormons think Adam is God, and have corrupted and changed the Gospel (and history) of Jesus in defiance of Paul's warning. Jehovah Witnesses and Islam reject Jesus and the redemption He offers completely. Masonry not only rejects Jesus as the way to salvation --Masons mistakenly or purposely treat all religions as equal-- and are aligned with "Lucifer their light bearer". The sign advertising "Free Stress Test" beckoned Marian Prescott as she crossed Farragut Square, and she found herself settling into a chair beneath a yellow tent and taking hold of two metal poles hooked up to a device that the tester said could detect psychic strain. Then Turrisi handed Prescott a paperback book, "Dianetics" by Church of Scientology founder L. Ron Hubbard, the back of which promised advice for living without "insecurity, negative thoughts, depression and irrational behavior." All Prescott needed to own this trove of wisdom was to fork over the "suggested" donation of $8. And so the bait and switch begins. The “free stress test” is the hook to get them to purchase (excuse me – it’s just a “suggested” donation) the Scientology book. The book will suggest Scientology training courses. These are free until it is revealed you need more advanced courses that have to be paid for. Scientology founder L. Ron Hubbard declared in the late 1940s: “Writing for a penny a word is ridiculous. If a man really wants to make a million dollars, the best way would be to start his own religion." As a fiercely secular nation, France has always had an awkward relationship with religious groups. Officials often find themselves struggling to strike the delicate balance between maintaining church-state separation and honoring the right of citizens to express their faith. But in the current case against the U.S.-based Church of Scientology, authorities have abandoned their usual attempts at fine-tuning religion's standing in French society — instead, they want to ban Scientology from France altogether. In a long-awaited trial that opened this week, French prosecutors are charging Scientology's French affiliate with organized fraud. Six of Scientology's top French officials are defendants in the case that began May 25. When investigating magistrate Jean-Christophe Hullin filed the findings of a nine-year inquiry with prosecutors, he described Scientology as "first and foremost a commercial business" whose interactions with followers are defined by "a real obsession for financial remuneration." The church's bookstores and celebrity center were described by Hullin's investigation as instrumental in ensnaring psychologically fragile people "with the goal of seizing their fortune by exerting a psychological hold." Back in Britain strangers have called on my neighbors, my mother-in-law's house and someone spied on my wedding and fled the moment he was challenged. I have met mothers who say they have suffered Scientology "disconnects" - meaning that their children have cut them completely out of their life so that they can spend more time with an organization which a judge in 1984 characterized as "corrupt, sinister and dangerous". I apologized almost immediately, Tommy carried on as if nothing had happened but meanwhile Scientology had rushed off copies of me losing it to my boss, my boss's boss and my boss's boss's boss, the Director-General of the BBC. 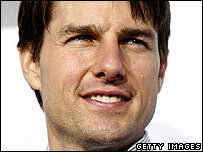 The German defence ministry said Cruise has "publicly professed to being a member of the Scientology cult". Cruise's producing partner Paula Wagner said the star's own convictions had no relation to the film's content. "Personal beliefs have absolutely no bearing on the movie's plot or themes," she said. Scientology has been monitored in Germany in the belief that its activities are "directed against the free democratic order" in the country. Its status there as a commercial enterprise has prompted repeated protests from the organisation. German defence ministry spokesman Harald Kammerbauer said that Germany's military "has a special interest in the serious and authentic portrayal of the events of July 20, 1944 and Stauffenberg's person". Stauffenberg's son Berthold told the Sueddeutsche Zeitung newspaper earlier this week that he objected to Cruise taking the role because of his involvement with Scientology. "He should keep his hands off my father," Mr von Stauffenberg said. One Must be a Christian to be Saved! References for this is found in John 14:6; Acts 4:12, and 26:28; 1 Peter 4:16. One cannot be a Christian without verbally confessing the deity of Jesus the Christ. One cannot even pray to God, let alone have sins remitted by Him, without approaching Him through Jesus (John 14:6 and 13, 15:16; 16:23-24; Romans 5:2, and Ephesians 2:18). I know Muslims and Mormons, Christian Scientists, Jehovah Witnesses, Unitarians, Scientologists, Jews, Muslims, Buddhists, Hindus, Seventh Day Adventists -and many others - will not want to hear this, but the Bible declares that Jesus was the FINAL revelation of God to man (Hebrews 1:1-3). There have been no others.